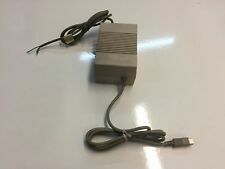 MICRO MATE COMMODORE 64 C64 VIC 20 POWER SUPPLY. Condition is Used. Dispatched with Royal Mail Signed For® 2nd Class. 2 x C2N tape decks (one with a box and test card). Commodore 64 Computer Job Lot. A Cheetah Annihilator Joystick (a bit of a rattle but works fine. ). Commodore C64 "breadbox", C64C, VIC20 compatible. Manufacturer is not responsible for any consequences of unauthorised or arbitrary repairs, modifications or unproper usage. Stabilized 5VDC up to 2.0A output. Commodore P.S. 25. for Commodore 64. Commodore VIC-20 / VC 20. Output: 5V DC 7.5W. Tested in fully working order. 3-84 year of production. 6 - In full working order, wthout any issues, Tested minimum 4h of non stop work. Limited Run with new style black Commodore 64 badge. Supports S-Video Output and 3.5mm Audio Output. Commodore 64. Comes with computer, power supply. MISSING TV cable. Original box. C64. Condition is Used. Comes with 2 joy sticks & 1 controller also Games. Dispatched with Royal Mail 2nd Class. Commodore 64 1531 Computer Datassette Tape Unit And Commodore Power Supply. Commodore 64 Datassette Tape Unit And Commodore Power Supply Only. The Commodore 1531, was made for the Commodore 16 and Plus/4 series compute Using compact cassettes as the storage medium, it provided inexpensive storage to Commodore's 8-bit home/personal computers. Wear and tear and marks across both units slight discolouration on the tape unit. Due to this priced low for selling. Condition is Used and sold as seen as I do not have the keyboard so cannot check if working. It’s over 30 years old and not been used for 15 but was fully working then. No refund if not working. Dispatched with Royal Mail 2nd Class Signed for. Selling 30 games and a joystick as well so get in touch to combine postage or make a deal. Commodore C64 "breadbox", C64C and VIC20 compatible. Manufacturer is not responsible for any consequences of unauthorised or arbitrary repairs, modifications or unproper usage. Risk of electrical shock and energy hazard. Stabilized 5VDC (2.0A) and 9VAC (1.1A) for C64, C64C or VIC20 computers. Manufacturer is not responsible for any consequences of unauthorised or arbitrary repairs, modifications or unproper usage. Stabilized 12VDC (0.5A) and 5VDC (1A) for 1541-II FDD or 1581. Stabilized 12VDC (0.5A) and 5VDC (1A) for 1541-II FDD or 1581. Risk of electrical shock and energy hazard. All failure should be examined by a qualified technician. Manufacturer is not responsible for any consequences of unauthorised or arbitrary repairs, modifications or unproper usage. Good Old Fashion Service. We will get back to you as soon as we can. Here's 6 good reasons.